You are here: Home / Sports / A GLIMPSE OF WHAT COULD BE! VALENCIA FOOTBALL IN SPRING: A GLIMPSE OF WHAT COULD BE! 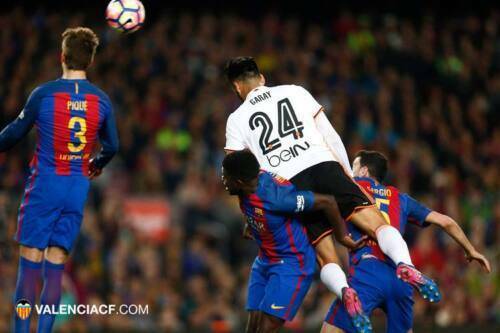 After a disastrous 2016, Valencia fans got a glimpse of what could be the future with an impressive 2-1 home victory over arch rivals and the then league leaders Real Madrid. From the word go, the home side were on the front foot and the shell- shocked visitors were two goals down inside the first ten minutes. 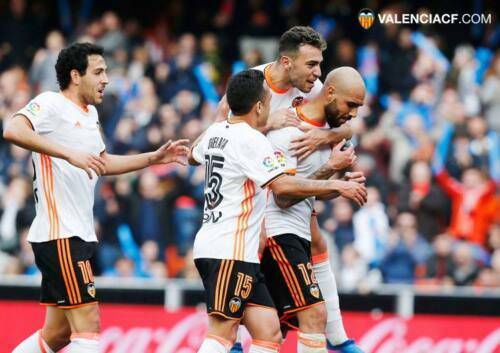 The first goal was one of the best to grace the Mestalla in many a season. Diego Alves quickly threw the ball out to Cancelo who raced away and crossed the halfway line before feeding Munir on the right wing. The former Barcelona star checked back onto his left foot and crossed to Simone Zaza who was in the penalty box with his back to goal and closely marked by Varane. The Italian striker took one touch to control the cross and then pivoted, turned and produced an ‘howitzer’ of a shot that Kaylor Navas could only watch fly past him into the top corner of the net. The Mestalla erupted into raptures with complete strangers hugging each other and asking themselves is this the same player who could not get into the West Ham side? Is this the same Zaza that missed a comical penalty for his country in the 2016 Euros against Germany when being brought on just minutes before the end of the game for that specific task? This wonderful stadium of Valencia, one of the oldest in Spain, was rocking even louder five minutes later when Fabián Orellana doubled his team’s lead. The Chilean international started the move after the breakdown of a Real Madrid attack. He fed Zaza, who quickly broke away and passed to Nani on the opposite side of the field. Nani responded by returning the ball back across the pitch into the path of Orellana, who had continued his run from Valencia’s own 30 yard line. The January signing then hit his shot from just inside the box and, to the delight of the majority of the crowd, it went under the legs of the Real Madrid keeper and into the back of the net. The decibels in the Mestalla were now akin to the daily Mascletas at the Plaza Ayuntamiento in March during Fallas. Another glory night was on the cards but had the hosts peaked too early? With very little time left in the first half, Cristiano Ronaldo halved the deficit with a wonderful header from a teasing Marcelo cross to slightly taint what had been a tremendous first half for Los Che. Unsurprisingly, the team from the capital dominated the possession in the second half but, for all their huffing and puffing, they failed to break down a resolute and determined Valencia side. Both goal scorers were substituted in the second half after giving everything and the four minutes of injury time added by the referee seemed an eternity, with the home supporters baying for Ricardo de Burgos Bengoetxea to blow the final whistle. Thankfully, the ‘arbitro’ obliged, eventually, and the players headed as one to the centre circle to receive thunderous applause from the fans before heading off to celebrate in the dressing room. It did not go unnoticed by many of the Valencia aficionados that the two players that scored in the Madrid game were the two signings made by Los Che in the January transfer window and neither have an affiliation with super-agent Jorge Mendes. This may be coincidental or it may be finally sinking in to the owner Peter Lim that relying heavily on one agent’s player database is not a winning formula. Sadly, Valencia CF were absent in team-spirit and attack in the following match away to Atletico Madrid, who beat Voro’s rather colourless side 3-0 in la Liga. Off the field, the Singapore businessman still has a lot of work to do to convince the Valencia CF faithful he has the club’s best interests at heart. 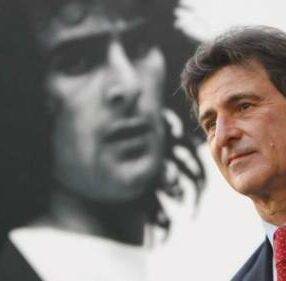 Lim rarely comes to Valencia games these days and his failure to renew the contract of Mario Kempes as an ambassador of the club did little to appease the fans concern. Indeed, it angered the Curva Nord to the point that they requested that supporters in the tenth minute of games chant “Kempes Si, Lim No” in the near future. Commercially, the club have announced a partnership with betting company ‘Bwin’. At the end of February, an official communication came from the club that José Ramón Alesanco has become the new Sports Director of Football replacing Jesus Garcia Pitarch who resigned in January. Alesanco has a good football pedigree having played for Athletic Bilbao, Alaves and Barcelona. He has also managed two Romanian teams, FC Universitatea Craiova and FC National Bucharest. He will be supported by former Valencia favourite Vicente Rodriguez (El puñal -The dagger of Benicalap) who is the new technical secretary. Vicente’s first ever professional club, Levante UD, continue to go from strength to strength at the top of their division. With three wins and a draw in the month of February they are now well clear of second place Girona and have an almost unassailable lead over third place. Such is Levante’s dominance, it would take a major downturn in fortunes for Los Granotas to not win promotion back into La Liga at the first time of asking. At home, Levante UD came back from an early goal down to beat Elche 2-1 in a nerve-wracking encounter with a late penalty deciding the match. Anyone wishing to buy tickets for Valencia or Levante can find more information at the following websites.